In 1845, Kamehameha III established a permanent seat of government in Honolulu. He acquired for his capitol a one-story coral building called Hale Ali`i, meaning House of the Chiefs, which stood on the site of the present palace. Kamehameha V renamed Hale Ali`i, `Iolani Palace in 1863 to honor his deceased brother Kamehameha IV. `Iolani, bird of heaven or royal hawk, a name belonging to Kamehameha II. King David Kalākaua was the first monarch to travel around the world. While visiting Europe, he took note of the grand palaces of other monarchs. He dreamed of a royal palace befitting of the sovereignty of a modern state such as Hawaiʻi. King Kalakaua laid the cornerstone of the new `Iolani Palace on December 31, 1879 - Queen Kapi`olani's 45th birthday - and the palace was completed in 1882. Designed in an "American Florentine" style, the four-story palace included an attic and basement, two central and four corner towers with open lanai on all sides. The rich interior used native koa, kou, kamani, and ohia woods plus American walnut and Oregon white cedar. It was one of the first buildings in Hawai`i fitted with electric lights. 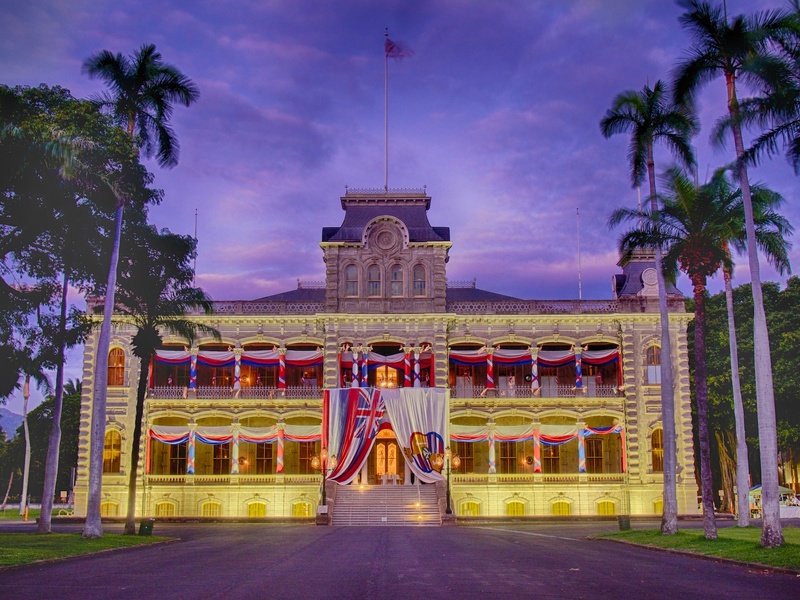 After the monarchy was overthrown in 1893, the building was used as the capitol building for the Provisional Government, Republic, Territory, and State of Hawaiʻi until 1969. The palace was restored and opened to the public as a museum in 1978 and is open Monday through Saturdays from 9am to 4pm. Iolani Palace is the only royal palace in the United States. 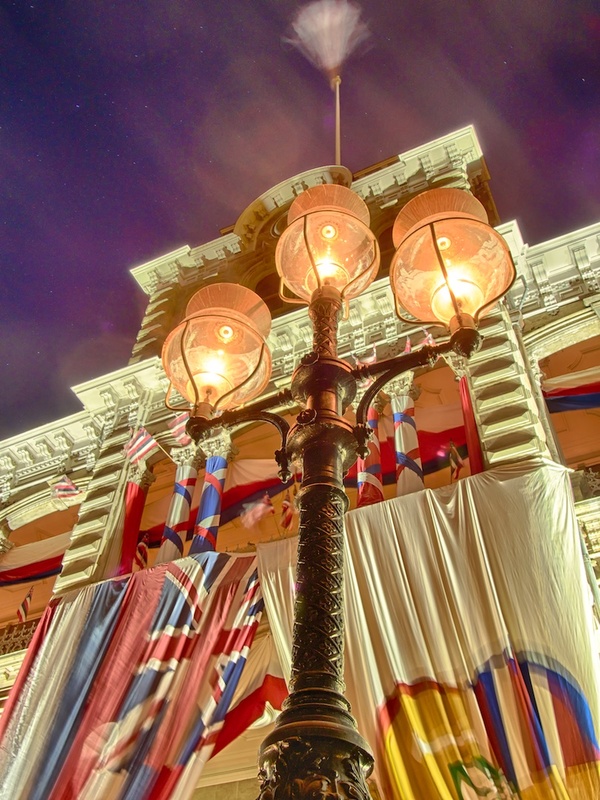 The picture was taken during celebrations of David Kalakaua’s birthday anniversary (November 16th) decorated with Hawaiian flags and red, white and blue bunting.